A thick plume of smoke could be seen for miles around, while witnesses reported people jumping from open windows near the top of the 24-story building after being trapped by the advancing flames. London fire: 6 people have been killed and over 70 others injured. LONDON: At least six people were killed, more than 70 injured and many others missing on Wednesday as a fire ripped through a high-rise apartment building in west London where residents had long warned of the potential risk of a catastrophic blaze. A thick plume of smoke could be seen for miles around, while witnesses reported people jumping from parts of the 24-story building after being trapped by the advancing flames. Children banged on closed windows as they were enveloped by the dark smoke. A woman dropped her baby from at least a dozen stories up, desperately hoping someone would catch it in the streets below. Hundreds of other residents, many who had been asleep when the blaze broke out shortly before 1 a.m., were forced to flee down dark and smoky stairwells. Grenfell Tower, which is public housing for poor and disabled residents of one of London's poshest neighborhoods, was engulfed within minutes, said locals. "It was like a horror movie, smoke was coming from everywhere," said building resident Adeeb, who hobbled down nine flights of stairs on crutches with his wife and three daughters. Adeeb, who declined to give his last name, said there had been no alarms, and that he only learned of the fire when his daughter woke him. "She said 'I can see fire' and I opened the door and could see smoke," added Adeeb, who is originally from Syria but has lived in Britain for 16 years. One of his daughters was hospitalized. The fire raised immediate questions about how a recently renovated high-rise apartment building in the center of one of the world's wealthiest cities could so quickly become a 24-story inferno, with no alarms or sprinklers to help save those trapped within. Residents had complained in recent months that the management company was flouting fire safety rules, including by providing inadequate escape routes. Officials said the cause of the fire was still being investigated. Terrorism was not suspected. A witness interviewed by the BBC said his fourth-floor neighbor had awakened him around 1 a.m. to tell him that his "fridge had exploded." Another witness told the broadcaster that the concrete building's exterior cladding, which was just added last year, had "burned like paper" as the fire leapt from one floor to the next. Law said that British regulations are intended to halt the spread of fire between units and floors in high-rise buildings, but that when that fails "the consequences are often catastrophic." London police said six people were confirmed dead, but expected the toll to rise. Emergency services said at least 74 people were being treated at five area hospitals, with at least 10 in critical condition. The building is home to about 500 people. At least 40 fire engines responded to the scene, with 200 firefighters involved in a futile effort to contain the blaze. Many rushed into the building wearing breathing tanks, searching floor by floor for survivors even amid concerns that the structure could collapse. London Fire Commissioner Dany Cotton said a structural engineer was monitoring the stability of the building, but that it was still safe for rescue crews to enter. She said firefighters had climbed as high as the 20th floor to rescue residents and carry them down the building's stairwell, and that the searches continued. The fire, which was believed to have begun on one of the lower floors of the 120-unit building, was still burning as of noon in London, some 11 hours after it began. "This is an unprecedented incident," Cotton said. "In my 29 years of being a firefighter I have never ever seen anything of this scale." Speaking within sight of the burning high-rise - originally white and gray, but most of which had turned a charred black - Cotton said she would not speculate on the ultimate death toll because of the "size and complexity" of the building. Throughout the morning, witnesses reported harrowing scenes as residents trapped in top floors leaned out windows, flashing their cellphone lights and calling frantically for help. James Wood, a 32-year-old graphic designer who lives in an adjacent building, said he saw a woman at about the 13th floor holding a baby out a window until all hope of a rescue had passed. He said he also saw children, about 5-years-old, banging on a closed window. Wood said he had been part of a campaign to force the borough council to enhance the fire safety in his own public-housing building, but he said the council had not acted. "Anyone who earns below 10 million pounds a year is not human in this borough," he said. "They don't care about fire safety." Sajad Jamalvatan, a 22-year-old biomedical engineering student, was at a movie at the nearby Westfield shopping center with his sister when his mom called to say their building was on fire. Minutes later, he was back in front of the high-rise and watched a horror scene unfold. "As soon as I arrived, someone pointed and said 'someone is jumping, someone is jumping.' About 16th or 17th floor, we saw a body coming down." "Seeing people die in front of you . . ." he stared at the sidewalk as his voice trailed off. He said the blaze had advanced quickly, and that the alarms did not appear to have been triggered. "There are plenty of alarms in the building, but no alarm went off," he said. "When I arrived, there were 10 flats on fire. After that, the whole building was on fire." "It went like that," he said, snapping his fingers. As of midday Wednesday, many people continued to search for loved ones. Ahmed Chellat, a retired 60-year-old, said he was searching for his brother-in-law and his wife, as well as their three children, the youngest of whom is 8. He said he had spoken to the wife at 1:45 a.m. and that she was still in their apartment on the 21st floor. "She wasn't panicked," he said. "I said, 'Why don't you come out?' She said 'They are telling us to stay in. They are asking us to cover doors with towels.' "
Half an hour later, he called her again. "The last thing she said was, 'Smoke was coming heavily into the flat.' "
He has not heard from them since. From an adjacent building, he said he could see Grenfell's exterior cladding, which he said was made of plastic, hear the building's exterior cladding catch alight. "You could hear it cracking - hear it flying," he said. "If it was brick it would not have caught fire as quickly." "I never imagined this could happen in London," he said. London Mayor Sadiq Khan said there were "genuine questions that people across the country who live in tower blocks will have. They need to be answered." But he said for the time being, the focus is on search-and-rescue - and that it would soon shift to recovery of the dead. By midmorning, an acrid smell permeated the area. About 100 people - residents, worried family members and onlookers - stood outside the nearby Rugby Portobello community center. Some were still in their pajamas, having fled in a panic hours earlier. Neighbors streamed into the center with food. One man pushed a baby stroller teetering with bottles of water, jugs of milk and cans of baked beans. Grenfell Tower is surrounded by some of London's most desired areas, home to celebrities, politicians and wealthy foreigners. It's just a short walk from Kensington Palace. But the area also includes pockets of poverty, especially in a cluster of high-rise buildings that mark an unofficial western entry point to central London. Residents of the building, which was constructed in 1974, had long warned of potential fire hazards even though it was completely renovated just last year. "It is our conviction that a serious fire in a tower block or similar high density residential property is the most likely reason that those who wield power at the KCTMO will be found out and brought to justice!" a residents organization, the Grenfell Action Group, wrote in a blog post last year. 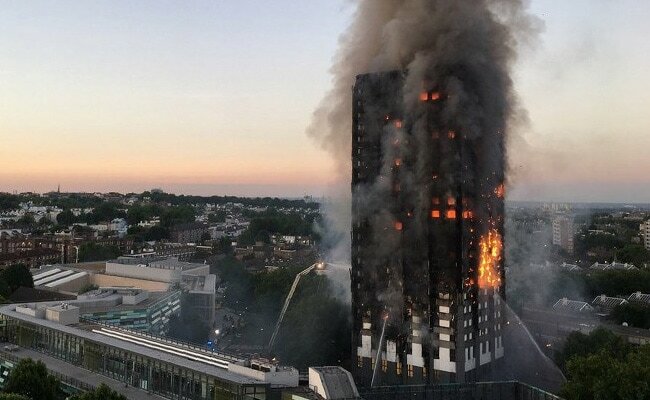 KCTMO, which stands for Kensington and Chelsea Tenant Management Organization, is the group that runs public housing on behalf of the Royal Borough of Kensington and Chelsea, the west London area where the fire broke out. On Wednesday morning, the Grenfell Action Group's website was updated, with a post on the fire. "All our warnings fell on deaf ears, and we predicted that a catastrophe like this was inevitable and just a matter of time," the post read. Residents said they had been instructed by management before the blaze to stay in their apartments in the event of a fire and to wait for emergency services to arrive. They said they had been told that their units were fireproof for at least an hour. Rydon, the company that handled last year's $11 million renovation, issued a statement saying its work "met all required building control, fire regulation and health and safety standards." The firm said it would cooperate with investigators. The management company had no immediate comment. Nick Paget-Brown, who leads the borough council, told the BBC that there would be "a thorough investigation into "why the fire started and why it spread so quickly." He acknowledged that residents had expressed concerns before the fire, but did not specifically address them on Wednesday. "There are always concerns about fire safety in high-rise buildings," he said.